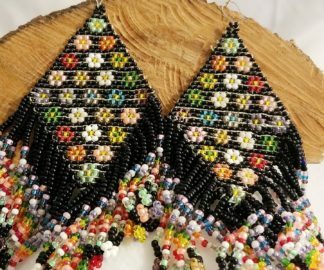 These Dark Daisy Hand Woven Earrings are exquisite, and intriguing all at the same time. These Dark Daisy Hand Woven Earrings are exquisite, and intriguing all at the same time. Hand woven glass bead by glass bead in a flower pattern with care to make a splendid pair of earrings. These earrings are a bit on the heavy side as of how many beads are in them. Seed Bead- The most colorful and versatile of beads, waiting to be transformed into elegant seed beaded creations. Delica seed beads are the world standard for high-quality. Perfect for precision work, Seed beads are available in sizes 8/0 to 11/0, they can also come in other shapes as well and will be called different things. They can be made from acrylic or glass, i use both and they come in a wide variety of colors as well. 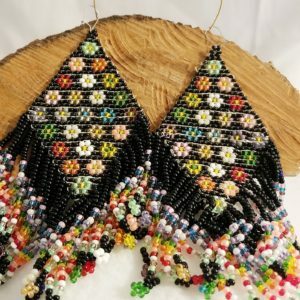 Beadwork-is the art or craft of attaching beads to one another by stringing them with a sewing needle or beading needle and thread or thin wire, or sewing them to cloth.Beads come in a variety of materials, shapes and sizes. Beads are used to create jewelry or other articles of personal adornment; they are also used in wall hangings and sculpture and many other artworks. This unique item can’t be back ordered or custom ordered in a different color. This is a piece that my Mother made, and since she's passed. You will have a piece like no other person has. 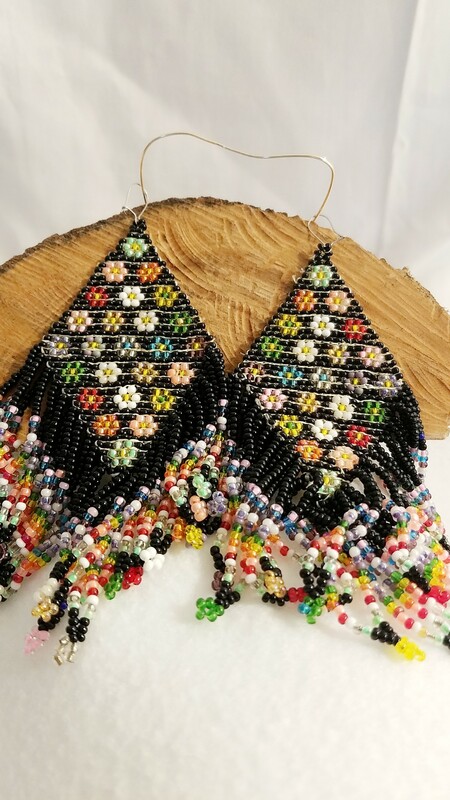 If you would like to know more about the gemstones, rings, and items that are used in making handmade items like this, Dark Daisy Hand Woven Earrings; please take a look at the Material Description Page and my Chain Maille Descriptions page. Being a proud wife of a veteran a lover of a menagerie of my furchildren. I try to extend my love of gaming, geekiness, motorcycles, and nature among other things into my crafted items and hope it shows.